1987 Sunsetter: Seeking help troubleshooting an engine issue. 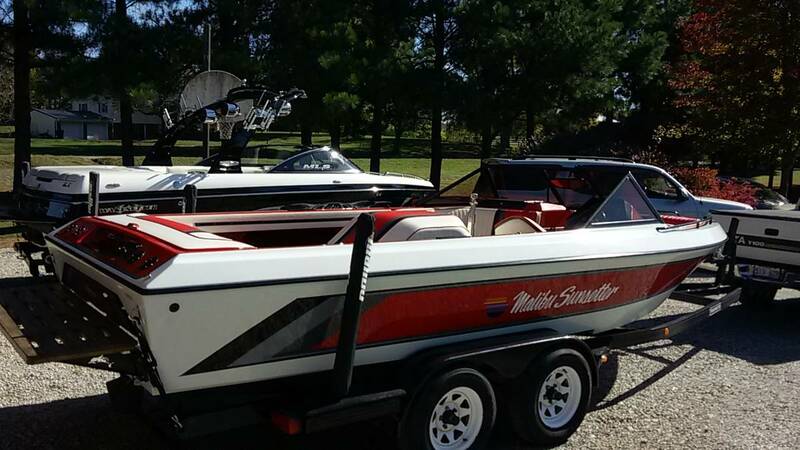 I own a 1987 Sunsetter with the Mercruiser 5.7 liter Competition Ski engine. Quadrajet carburetor. Mechanical fuel pump. When the boat is launched, the engine will operate flawlessly for 15 to 20 minutes, then lose power, bog down and die if under load. Seems to be running rich when this occurs. The engine will re-start with ease and idle fine after bogging down but dies when placed in gear. If we allow the boat to sit and cool off for a while it will then run well for 15 to 20 minutes and then begin acting up again. I will be around the boat the week after next and my goal is to at least identify the root cause of the issue. All input is greatly appreciated. I have researched this issue extensively and performed several troubleshooting / maintenance procedures in an effort to identify and resolve this issue. Went through the entire fuel delivery system. Replaced all fuel hose between fuel tank and fuel pump. Carburetor was replaced by the previous owner and looks like new inside (what can be seen) and out. Choke works as designed. Accelerator pump delivers fuel when operated. Running the boat on a portable fuel tank yields the same results as running on the normal fuel system. Set engine timing at 10 degrees BTDC at idle with the engine at normal operating temperature. Mallory distributor with mechanical advance. Replaced the spark plugs and wires. Verified battery, alternator and ignition system voltages normal when the engine is acting up. Cylinder compression test revealed cylinder #8 compression (126 psi) is approximately 20% lower than the other 7 cylinders. All other cylinders' compression around 160 psi. The port side exhaust riser runs noticeably warmer than the starboard side. Last week when this happened I loosened the distributor hold down clamp and change the timing a bit (uncertain whether I advanced or retarded the timing) and the boat ran well enough to limp it back to the ramp. I do not believe this is a vapor lock issue, but may be wrong about that. I once owned a Mercruiser Black Scorpion engine with vapor lock issues. That engine would not start at all when the vapor lock issue was present. I likely left out some detail of all the troubleshooting I have performed. 3. One of the most technically knowledgeable guys I ski with referred me to Ron Tanis, (owner of Skiboatpartsonline.com and Tanis R&D) and Ron was unbelievably helpful and knowledgeable. To those who said its a carburetor issue, I hope you know I wasn't intentionally blowing anyone off, just trying to eliminate easier/cheaper items first. I too am convinced after speaking with Ron that its a carburetor issue. He said he sees this twice a week in boats of this era and motor combination - the cause is almost always old fuel line not designed for ethanol. Specifically non-USCG approved stuff without a E-15 certification on it. The Ethanol fuel breaks down the inside of the lines into bits of rubber not visible to the naked eye, which he said is attracted to the needle valves and attaches over time. 4. When the motor is choked and fuel is cold the motor will run "ok" but when it heats up the needle valve won't seat properly and fuel will flood past right after coming off a run, partially flooding the motor. When you cut the throttle and go look for fuel flooding in, you many times won't see it happening. He said to run the boat with the engine cover off and the spark arrestor/air cleaner off, and immediately when coming off throttle after a longer run watch for the fuel trickling out and running down the inner walls of the carb. I don't think that ended up being his problem it but may be worth checking out being that you have pretty much everything else covered. An old mechanic told me these old boats sometimes have an inline ballast resistor in the wiring, and they can go bad. Maybe they go bad when they heat up? I have looked for a ballast resistor in the ignition wiring circuit but have not located one. The wiring diagram in my engine manual does not specifically identify a ballast resistor in the ignition circuit, but I suspect there may be a resistor in the circuit based on limited research. I plan to replace (upgrade) my distributor next spring, so I will have to determine for certain whether or not my ignition system contains a ballast resistor. @Murphys: With a new carb on your boat, I would suggest getting the fuel out of the bowls just to make sure they are nice and clean next spring. Not mandatory, but can be helpful, did you add stabil to the fuel for storage. I did treat the fuel with Sta-Bil and fogged the engine by spraying 8 ounces of fogging oil into the carburetor as recommended in the Mercruiser manual. I use only conventional fuel (non ethenol) in our boats. How would I remove fuel from the carburetor bowls? An easy way is to install a fuel shutoff valve and turn it off. Then just run the engine until it dies. I do this with lawn mowers every fall. For some reason (bad needle valve I think) they tend to have problems. @Murphys: I use (an old) turkey baster, CFO says not to bring it back to house.